Previously we have talked about tools to check your installed software to see if there are any updated versions available, and how it’s useful to get the latest release not just for the latest features but also for fixing bugs and security vulnerabilities. Updating tools such as SUMO and FileHippo Update Checker are great at checking for the latest versions, but they don’t offer the chance to install the software for you as well, which can be a useful function if you have many applications that are in need of updating. Here are 3 tools that go that little bit further and offer the chance to install the found updates for you, and also with an option to do it without any user interaction. Soft2Base is a program that does a little bit more than simply checking for and install updated software, because it can additionally offer to download and install any of the titles stored in its database if you don’t already have them. Soft2Base can also install a new application or perform an update install for you silently in the background. The program uses a constantly updated online database to compare against and the supported application list is currently around 80 titles which isn’t a lot, but many of the major freeware titles are included. A number of system runtimes such as the .NET Framework, DirectX, Java and Silverlight are also in the list and can be updated as well. The window shows all the titles that are available for download. Blue icons are applications not currently installed, the green are up to date and purple icons are for software you have installed and an update is available. The list can be filtered using the options on the left. When your choices are made, it’s simply a case of which method you want to proceed with. The files can be downloaded only, installed with the individual software’s own install dialog being displayed, or a silent install which suppresses any dialog windows during the install process. This could potentially skip the junk stuff like toolbar’s or home / search page changers. Soft2Base also has an Offline mode where you can download all the applications in the list and then put everything onto a USB stick and use the updater without requiring the internet. 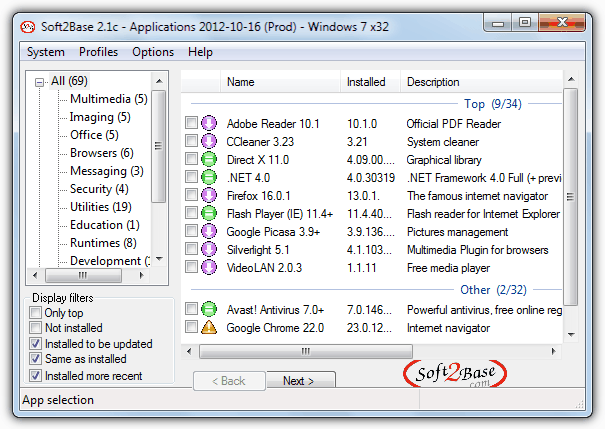 Soft2Base is a portable executable and is compatible with Windows XP, Vista and 7 32-bit and 64-bit. 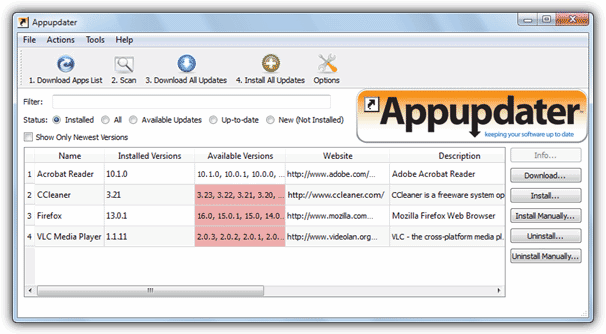 Appupdater is an open source utility and gives users not just the latest software updates, but also the ability to download several of the previous versions as well. We would however not recommended to use older versions unless there is a specific reason to do so. There’s also an option to include your own search directories so custom locations can be scanned by default. When the program is started you have to select the file repositories that contain the update information, simply select both to be sure. There could be a slight bug here in that the program wouldn’t let us scan for updates unless we went to the Security tab in Options and selected “Skip” in Signature Check before downloading the App list. There are some filters on hand to narrow or widen the search, and the check box to “Show only newest versions” will hide the multiple versions available for each program. Double clicking will pop-up some extra information such as the auto install arguments and filenames to download for all previous versions. Software can be downloaded, installed silently or installed manually. 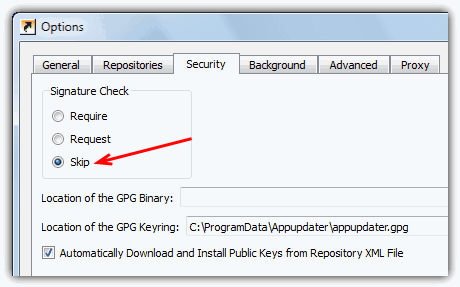 Appupdater has both installer and portable versions but the portable version cannot monitor and automatically install updates in the background. When CNET decided to start bundling their own adware wrapper with ordinary freeware titles, it caused quite an uproar and rightly lost them huge numbers of visitors. There’s no denying though that the website is one of the biggest on the internet for finding and downloading software and the TechTracker tool aims to take advantage of this fact. While the other tools here rely on maybe a few individuals to update and maintain their databases, TechTracker’s database is the CNET site so the chances of it detecting up to date and the correct software is quite good. 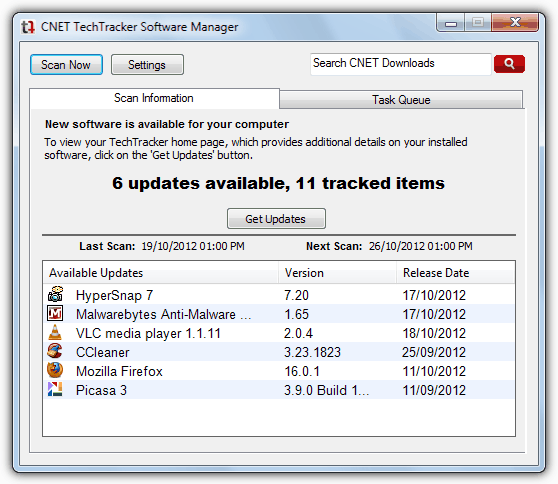 When you download and install TechTracker make sure to get it from the Direct Download link to avoid the adware wrapped version. The program is very easy to use and will start scanning your computer when it’s launched. If updates are found it will tell you and display them in the window, the “tracked items” is simply how many programs it’s identified and can check for newer versions. Click the Get Updates button and a web page will open up with the results. The webpage gives you a wealth of details about the scanned software including various CNET information such as ratings, reviews, download stats, and also whether you want to hide, skip or auto download updates to each program. There are various ways to get the updated files from simply bulk downloading them and installing at your leisure using the “Download all updates” button, to individually getting them updated or in a user selected batch. 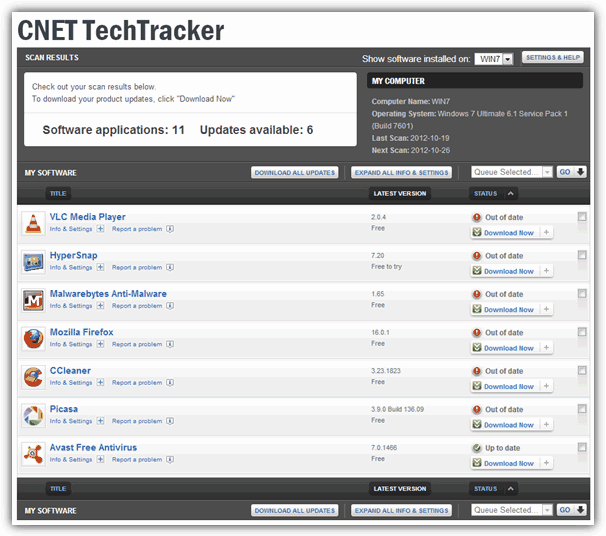 Download progress for each program will show in the TechTracker application window. The install is handled by the selecting of either the standard install method which simply downloads the file and then runs a normal install process as if you double clicked on the installer file yourself, or the other way is a Smart install which runs the installer silently and you won’t have to interact with any dialogs at all while the software is updated. You can also choose to individually or batch uninstall any programs if no longer required. TechTracker works on Windows XP and above. You’ll be pleased to know non of the files downloaded with TechTrcker have the CNET wrapper attached and they are the original installers. Special Note: It’s worth mentioning that while these software updaters / installers offer a silent update function, there is always the possibility of adware bundled with installers accidentally getting installed by mistake due to the developer making changes to the installer that the update software hasn’t recognized yet. It is our advice that unless you KNOW FOR SURE a software doesn’t contain adware or the installer hasn’t changed significantly in recent releases, use the manual update methods instead. 1. Soft2base executable has not been updated since 2012 and has many problems. 2. Appupdater is no longer available. The article was written around 2013, a website plugin bug accidentally rewrote the article’s updated date to 2016, hence Google getting a date of 2017. Sorry for any misunderstanding. Please specify which of these tools I am allowed to use at my company (in a commercial environment. The Soft2Base website says “Please contact us before any usage in any company or business.”, Appupdater is open source and can be used in a business environment, Techtracker doesn’t says but it’s no longer available anyway and has been discontinued. Soft2base v2.1 has been released. @john: could you indicate which application(s) have installed the Ask bar + your OS. Your contribution will be appreciated so that this can be avoided. Installed Ask toolbar, set home page, etc. when installing some of the applications. Avoid and use ninite.com which doesn’t have this issue. To avoid virus, Soft2base is using setup files from their respective editor’s web site. No junk bar or unneeded tools, I hate that so I spend a lot of time to find a way to desactivate them during silent installs. Last but not least, it offers international setup of application. Filehippo is interesting but for en applications only. @minddoctor: You are relying too much on one source of information, which only indicated that it was unfamiliar with the ‘new’ software. Every single security software throws false-positives. Did you double-check the file with VirusTotal or VirSCAN ? I’m sure Raymond did before he suggested we take a look for ourselves. My Windows 7 & IE9 download filter, “says program “Soft2Base”, is not common and could damage your computer”. (Option to delete or run). If I know the software I run, no knowledge of the software “I block and delete”. I use Filehipp Update Checker.